A meeting between representatives of the Trust and the football club took place on Wednesday 18th November. Present were Chairman Peter Ridsdale and Group Finance Director Alan Flitcroft representing the club, and Chairman Paul Corkrey, Vice-Chairman Tim Hartley, Community Officer Tracey Marsh and Membership Secretary Dave Sugarman representing the Trust. The following is a report of the topics discussed. Apologies for the slight delay – the Trust reps have been waiting for clarification on several issues, which were only forthcoming from the club via e-mail late last week. Many of the points raised by members via e-mail were communicated to the club’s officials by the Trust representatives. In particular, strong objections were raised about the fact that fans can only pay for Platinum Ambassador Season Tickets in instalments via an agreement with the Zebra Finance company as opposed to the interest-free option which was available directly through the club last year. Peter Ridsdale defended the club’s stance. He said that Zebra Finance had been instructed by the club to approve all applications requesting the finance option, and added that he felt the deal on offer was fair for fans who wanted to take advantage of the five-year price freeze, particularly as the interest rate was relatively low. However, he added that the club would investigate the practicality of reinstating an interest-free option for standard season tickets when they go on sale in January 2010. He added that any season tickets purchased after December 2009 would definitely not qualify for the five-year price freeze. The Trust reps explained they felt that proper consultation with the various supporters’ groups would benefit the club when they were making decisions about ticketing policies such as the Platinum Ambassadors scheme. Peter Ridsdale he didn’t believe such consultation would have many any difference to the club’s decision in this instance, but he agreed that communication should be improved going forward. The Trust reps gave a summary of the rational behind the scheme and outlined the difficulties they were encountering in attempting to liaise with the club’s Football in the Community section. Peter Ridsdale said he supported the Trust’s initiative but was keen to avoid any duplication with the work being undertaken by FITC. Alan Flitcroft gave an undertaking to quickly determine whether the club’s FITC section were going to get actively involved in the initiative or not. The Trust reps requested that Peter Ridsdale attend a meeting with Trust members in January. The Chairman agreed to do so and a date will be announced for the meeting in due course. The Trust reps requested further batches of free tickets for home matches to be distributed to community groups, as happened for the QPR and Derby games. Peter Ridsdale said he supported the idea and Alan Flitcroft undertook to engage with the FITC section to ensure no duplication of work takes place. The Trust reps outlined their dissatisfaction with the club’s lack of marketing by comparison to other local sports clubs such as the Cardiff Blues and the Cardiff Devils. The reps said they felt visibility for the club at public events across South Wales was important, not only in attracting new supporters but in helping to change the perception of the club from the general public. Alan Flitcroft stated the club would like to be doing more but needed to keep a check on its finances in that regard. Peter Ridsdale defended the club’s current marketing strategies but accepted that more could be done, and he assured the reps that it will be done id due course as the club moves forward. The Trust reps outlined the latest situation with regards to the campaign and asked for the club’s support. Peter Ridsdale confirmed the campaign has his full support. The Trust reps complained about the availability and quality of the merchandise stocked by the club shop. Peter Ridsdale said he fully understood the shop wasn’t good enough at present and gave assurances that stocking levels would improve in due course. The Trust reps requested access to the Family Stand for a forthcoming game. Alan Flitcroft stated this should be no problem and arrangements will be made in due course. The Trust reps requested that mirrors be placed in the women’s toilets according to the wishes of various female members. Alan Flitcroft said he will talk to Stadium Manager Wayne Nash and see if these can be provided. The Trust reps requested that more tables and chairs be positioned on the concourses around the ground. Alan Flitcroft said there may be a possible health and safety issue with moveable tables and chairs, but he undertook to consult with Wayne Nash and see if this is possible. The Trust reps relayed complaints from members about the time it takes to exit the stadium car park once games have finished. Alan Flitcroft replied that health and safety rules dictated the club must allow pedestrians to leave the stadium area before cars. He said he believed the wait was now down to a maximum of ten to fifteen minutes and said the local traffic lights had now timed better to ease congestion. The Trust reps asked if there was any news on the proposed memorial garden outside the new stadium. Alan Flitcroft gave an undertaking to find out what the latest situation regarding this issue is with the stadium’s management. The Trust reps said they felt the club is not doing enough to advertise the discounted ticket deals it is offering, particularly in relation to the Family Stand. Alan Flitcroft said that promotions were not adding significantly to ticket sales even when money is spent on advertising. However, he added that the club’s whole sales and marketing strategy will be reviewed in the New Year. The Trust reps requested clarification of the club’s financial situation. Alan Flitcroft admitted there is a cash flow problem, but Peter Ridsdale added that it is no worse now than it usually is at the club, and he totally rejected rumours that the club is about to enter administration. Peter said that negotiations with Langston representative Sam Hammam are ongoing and he said he expected an agreement to be reached very soon. He stated that neither party wants to go down the route of more legal action and suggested that both sides are keen to get the matter sorted out quickly. The Chairman confirmed that he was in talks with two potential investors in the club and hinted that those talks will have a positive outcome. He asked the Trust reps to assure members that the club is far from being on the verge of collapse as has been suggested in some quarters, and he painted a positive picture of the club both in the short and the long term. FANS are being invited by Cardiff City Supporters Trust to have their say on their favourite design for a statue in honour of the Bluebirds’ FA Cup winning skipper Fred Keenor. Supporters will be able to vote on the designs of James Done (below left) ,Michael Field (centre) and Roger Andrews (right) through forms in the South Wales Echo and here on the Trust website. Voting will close on Saturday, December 12th. Click each image to see a bigger version. Please vote using the poll at the bottom of the 2nd column of this webpage. 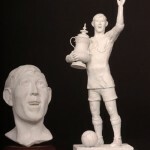 The three sculptors were asked to produce a maquette of their tribute to the 1927 FA Cup winning captain and Welsh international. Fred’s nephew Graham Keenor, who is a member of the Trust, said: “We’re very pleased with the work submitted by the three sculptors and now we want football fans to vote for their preferred design. Mike Inker, a member of the Trust’s Fred Keenor Memorial Committee, who originally launched an online petition in support of a tribute, said that the trust was giving fans the chance to vote online because of the many thousands of Bluebirds living across the world as well as in the UK. Roger, who hails from Llantwit Major, was commissioned to produce the statue of Sir Tasker Watkins, which now stands outside the Millennium Stadium. The Trust plans to launch a public appeal for funding in the new year and will approach Cardiff council, the Welsh Assembly Government and local businesses for financial support, along with football fans. City chairman Peter Ridsdale has given his total support to the campaign. 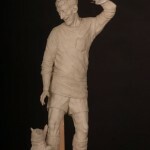 The Trust has received permission from the Football Association to use the image of the FA Cup as part of the statue. Fans who choose their favourite design through the Echo should send the form to CCST, PO Box 4254, Cardiff, CF14 8FD, by the December 12th closing date. Firstly, I would like to give a warm welcome to the new members who have recently signed up with the Cardiff City Supporters’ Trust, and I would also like to thank those of you who have renewed your memberships during the last couple of months. Your support is very much appreciated by the Trust’s board. As you are no doubt aware, the club is already offering fans the chance to buy season tickets for the 2010/11 campaign. The ‘Platinum Ambassadors’ deal involves a promise of a guaranteed price freeze for a further four seasons for those of us who are amongst the first 10,000 supporters to purchase season tickets before 31/12/2009. 1) The fact that the club has once again implemented a new ticketing policy without any consultation whatsoever with the Trust, the Supporters’ Club or any of the other fans’ groups. 2) The fact that supporters are now unable to pay for their season tickets by interest-free instalments (the only instalment option is through a company called Zebra Finance and involves paying interest at a rate of almost 20% on top of the price of a season ticket). 3) The timing of the deal. Selling season tickets in the last week of October is a totally unprecedented move as far as Cardiff City is concerned. It would suggest that our club is once again desperate to raise money quickly, which is a definite worry considering the increased crowds following the move to the new stadium, the much-publicised talk of new investment and the fact that we are less than three months into the current campaign. The Trust’s board will be meeting on Monday evening to discuss this issue, and ticketing policies are sure to be high on the agenda when our representatives next meet with the club’s officials. Therefore, we would like to hear your opinions on the subject of the Platinum Ambassadors scheme. Do you think this initiative is a positive or a negative step for our club to be taking at this point in time? Do you have any particular concerns about the way the deal is structured? Will you be taking advantage of the club’s ‘Platinum Ambassadors’ offer? If not, why not? Many thanks for your continued and much-valued support. Tiny Tilly Abraham has become the youngest-ever member of the Cardiff City Supporters’ Trust after being registered by proud father Annis less than forty eight hours following her birtTiny Tilly Abraham has become the youngest-ever member of the Cardiff City Supporters’ Trust after being registered by proud father Annis less than forty eight hours following heTiny Tilly Abraham has become the youngest-ever member of the Cardiff City Supporters’ Trust after being registered by proud father Annis less than forty eight hours following her birth. Tiny Tilly Abraham has become the youngest-ever member of the Cardiff City Supporters’ Trust after being registered by proud father Annis less than forty eight hours following her birth. Bluebirds fanatic Annis contacted the Trust the day after Tilly’s arrival and ensured that she joined mother Joanne and sisters Annaise and Alexandra on the membership roll. In the first issue of our Trust magazine, Moving to a Different Beat, we gave members a chance to win signed copies of the following books: Cardiff City Fans Through the Years by Annis Abraham Jnr, The Rise and Fall of the Cardiff City Valley RAMS by Gwyn Davies, and From Shattered Dreams to Wembley Way by Annis Abraham Jnr. When Annis Abraham Jnr first saw Cardiff City play in November 1973, the Bluebirds defeated Bolton Wanderers 1-0 in a Second Division game at Ninian Park. Which Cardiff-born Welsh international forward scored the winning goal? The answer was Gil Reece, who made over 100 appearances for the club between 1972 and 1976. David Hutchinson of Pontypridd, who wins a copy of Cardiff City Fans Through the Years. Cliff Jones of Bristol, who wins a copy of the Rise and Fall of the Cardiff City Valley RAMS. David Griffiths of Cardiff, who wins a copy of From Shattered Dreams to Wembley Way. The books will be sent out to the winners next week, but if they would like to collect their prizes before the Nottingham Forest game on Sunday, then they can drop membership secretary Dave Sugarman a line at the enquiries e-mail address below in order to make the necessary arrangements. Look out for another competition in the next issue of Moving to a Different Beat, which should be available in January. It was not a case of straight down the pub after the disappointment of the draw against Palace last month for some of us. No, members of the Trust’s Community Group were in celebratory mood as they joined in the festivities to mark Diwali at the Hindu Temple in Grangetown. Diwali is a five day festival when homes are decorated and candles and lamps lit, rather like Christmas celebrations. The festival celebrates the triumph of good over evil. In Hindi, Diwali means “Festival of Lights” and it commemorates heroic figures in Indian mythology that triumphed over the forces of evil. We had been invited to join the celebrations of the Hindu New Year by a group of young Hindus who had attended our community event at the stadium in September. One of the lads is a season ticket holder and the group asked some very probing questions about the Cardiff City FC and the local community. Our community evening was part of the Trust’s drive to bring club and the community closer together. Members of the Community group attended the Hindu centre in Grangetown to celebrate the third day of Diwali which is the last day of the Hindu calendar. We were given a fantastic welcome and made more good contacts on the night. The evening included the serving of some superb Indian food before we sat down for the special Diwali show of Indian dancing. The Grangetown Hindu Association has been running for 25 years and we were given a presentation on its history. The evening was also a chance for the Association to honour the academic and sporting success of young Hindus. As members of the Community Group we were particularly interested in the annual cricket tournament organised by the Association and we are looking at the possibility of organising a football tournament involving the Hindu community next year. Special thanks must go to Mr Arvind Vasani, the Chair of the Association, and Shanta Rupalia who made us so welcome and gave us such a fantastic evening.